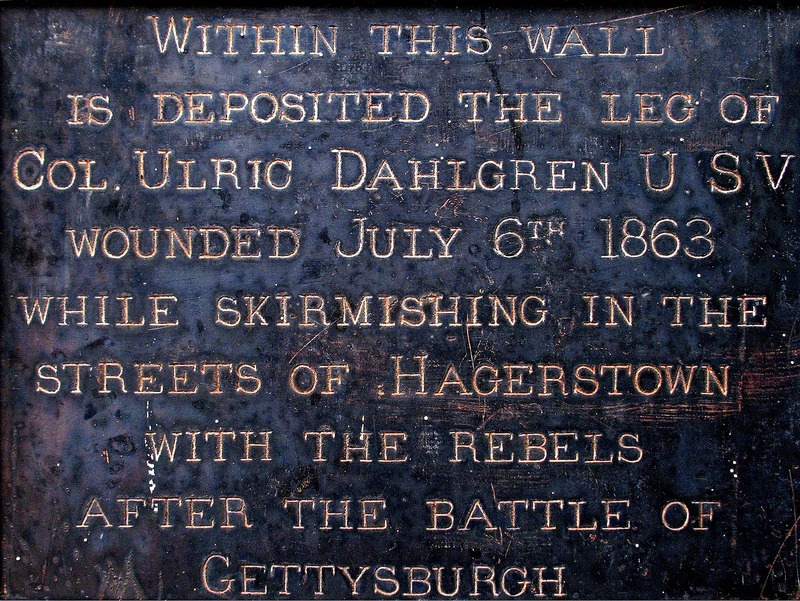 In July of 1863, in the aftermath of the Battle of Gettysburg, 21-year-old Captain Ulric Dahlgren, son of Rear Admiral John A. Dahlgren, directed a dismounted cavalry unit along the sidewalks of Potomac Street in Hagerstown, Maryland. 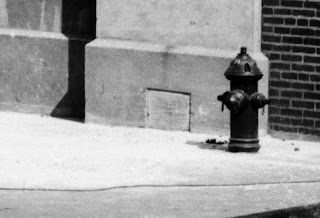 Dahlgren led on horseback as his men went on foot down both sides of the street. He got as far as Franklin Street when he was hit in the right foot during a Confederate volley fired from the nearby church. 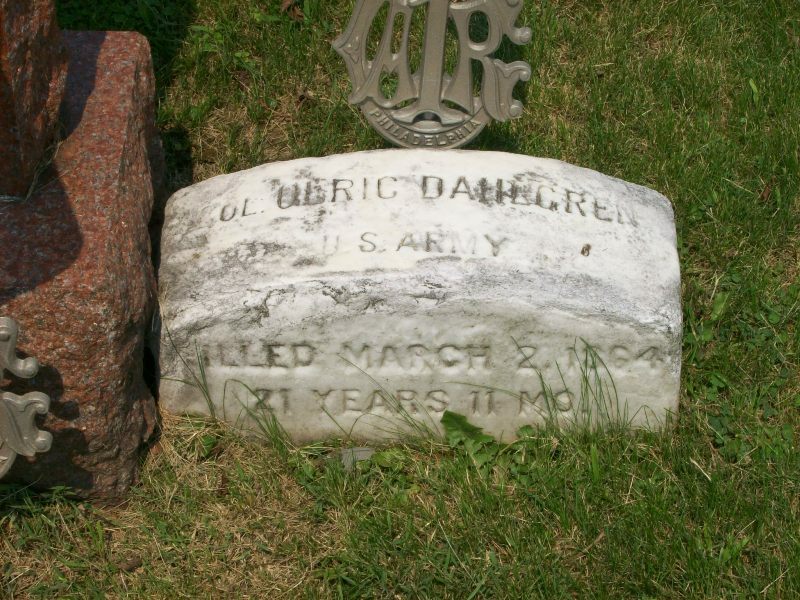 Dahlgren ignored his wound as he retreated with his men and, when reporting to General Kilpatrick, fell from his horse, passing out from shock and loss of blood. On July 9th, he was carried from the train station on a litter to his father's house in Washington. 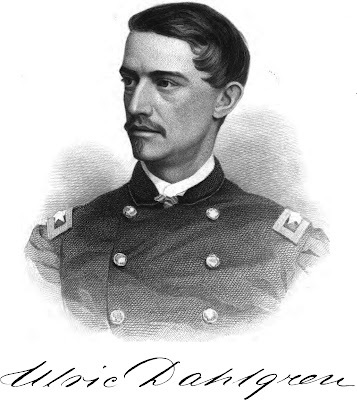 Young Dahlgren was promoted Colonel by Secretary Stanton but was not told for several days. Three days later, the attending surgeon decided the leg needed to be amputated. Col. Dahlgren recovered and returned to duty, riding with a wooden leg in the stirrup and a crutch tied to his saddle. 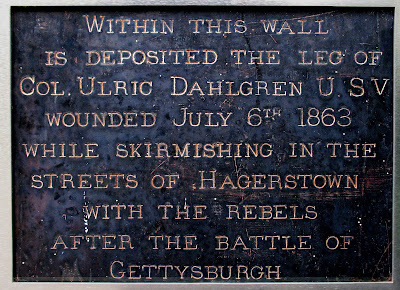 Wittenberg explains the fate of Dahlgren's lost leg. 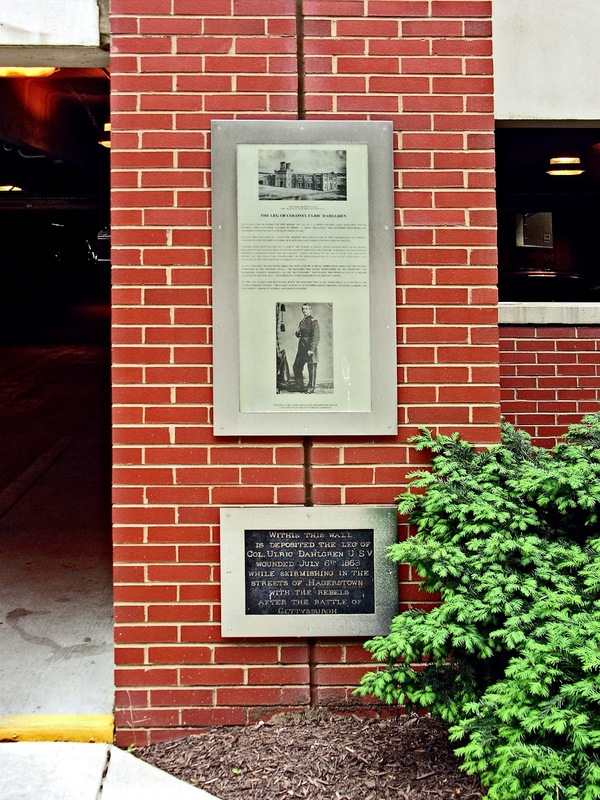 This plaque on the wall of Building 28 at the Washington Navy Yard is the one Admiral Dahlgren placed on the wall of his new foundry building to mark the burial site of his son's leg. Today building 28, the successor to the Dahlgren Foundry, is the NavSea parking garage. 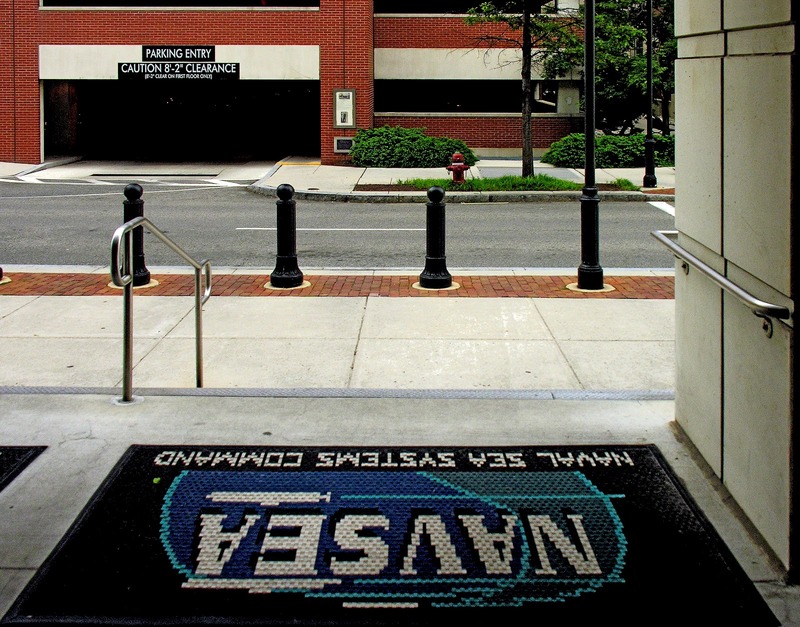 NavSea stands for Naval Sea Systems Command. 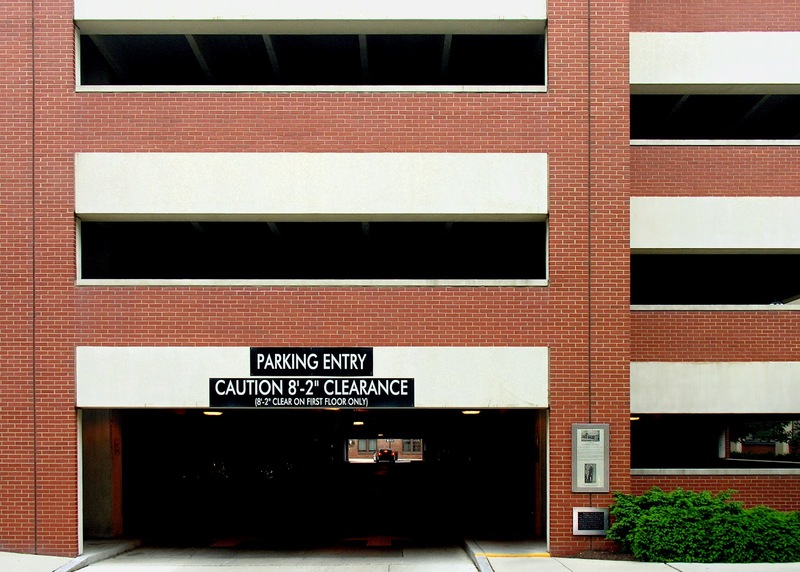 A 1998 plaque on the wall of the parking garage tells the story of Col. Dahlgren's leg. 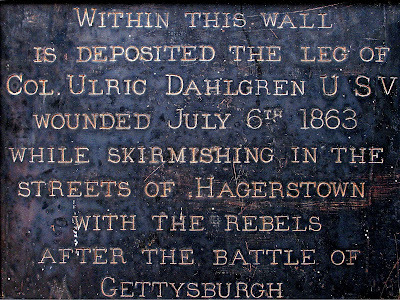 The plaque below marks the spot where the leg of U.S. Army Colonel Ulric Dahlgren, son of Admiral John Dahlgren, "father of American naval ordnance," was interred following his wounding after the battle of Gettysburg in 1863. 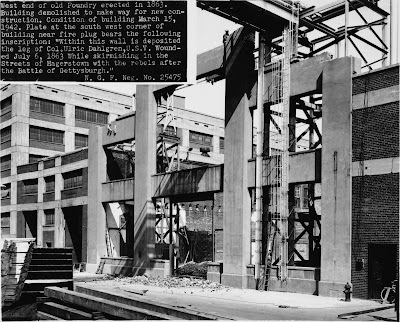 The leg was enclosed in a lead and wooden box and placed in the cornerstone of Admiral Dahlgren's new foundry, building 26 which was then under construction on this site. Colonel Dahlgren was killed in March 1864 during a failed Union cavalry raid on Richmond. Documents said to have been found on his body directed the capture or killing of Confederate President Jefferson Davis and his cabinet. Public outrage in the South over "the Dahlgren papers" set the stage for conspirators led by John Wilkes Booth to plan the kidnapping and eventually the assassination of Abraham Lincoln. 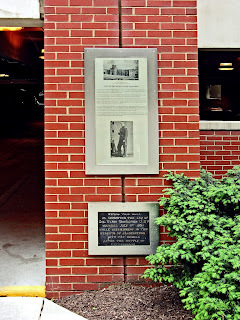 In 1915, Building 28 was demolished and replaced by a metal fabrication shop, and the plaque remained in the original wall. The building was again demolished in 1942, removing the remaining surface remnants of the 1863 foundry. The plaque was reinstalled at a higher location in the new wall. Mysteriously, Ulric Dahlgren's leg was not found. In 1998, the plaque was recovered when the building was again demolished to construct the NavSea parking garage. The plaque now rests in its approximate original location marking the southwest corner of Admiral Dahlgren's foundry. 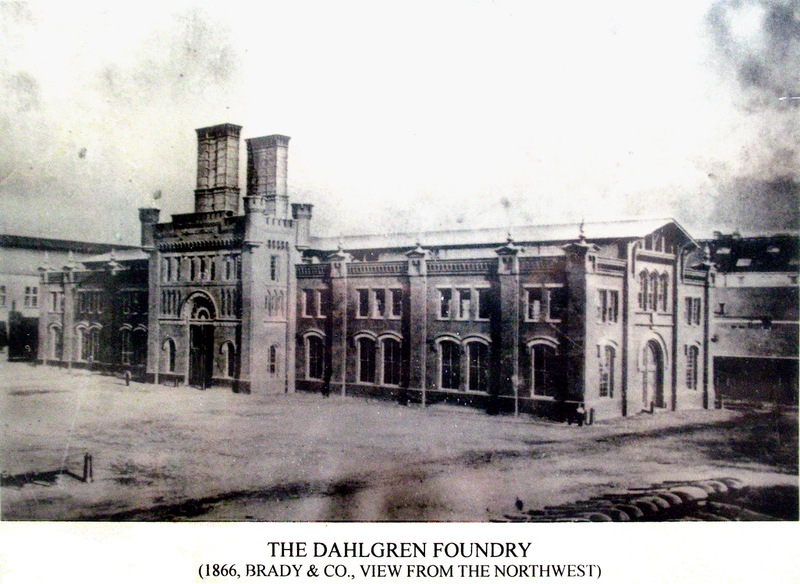 In 1915, a metal fabrication shop, building 28, replaced the old foundry but retained the wall in which Dahlgren's leg had been immured. In 1942, the metal shop was replaced with a new building. 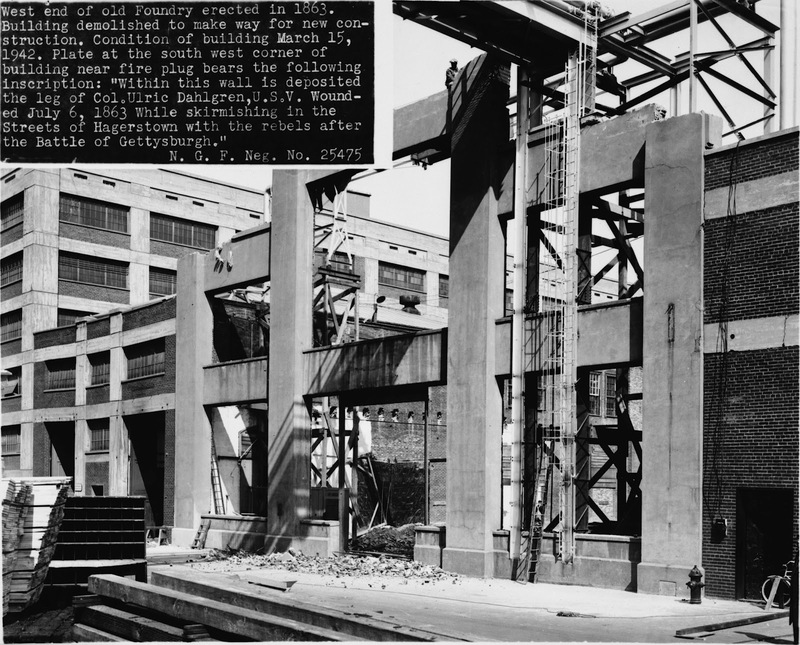 This 1942 LOC photo shows the remaining wall of the foundry about to be torn down. The attached note indicates that the plate marking the location of Dahlgren's leg was in the spot low to the ground behind the fireplug. It looks like the "plate" had already been removed. Strangely, the Colonel's leg was not found in the wall. Stephen M. Forman says that "When the original building was demolished to make way for a new one, the leg could not be found. 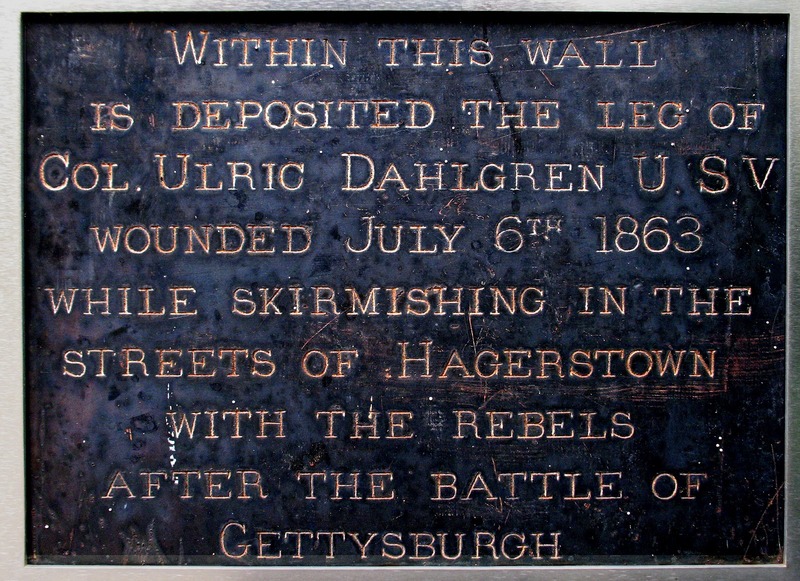 Some say that Confederate sympathizers opened the wall and removed the leg; other people believe that it was removed and buried with Dahlgren's body after his death." Dahlgren died on March 2, 1864, in an ill-fated cavalry raid on Richmond. A thirteen-year- old boy named William Littlepage found a paper on Dahlgren's body that indicated an intention to assassinate Jefferson Davis and his cabinet. "The men must keep together and well in hand, and once in the city it must be destroyed and Jeff. Davis and Cabinet killed." Although the authenticity of the Dahlgren papers continues to be disputed, the plaque on building 28 suggests that they "set the stage" for Lincoln's assassination. The Colonel's wooden leg, however, had its own career. Confederates removed a ring, the famous papers and Dahlgren's wooden leg before burying him the first time. The leg was displayed for a time in a Richmond department store. It was later given as a souvenir to Lieutenant James Pollard who led the troops that killed Dahlgren. When Pollard lost his own leg, he tried to use Dahlgren's but it didn't fit so he gave it to Capt. John Ballard of Mosby's Rangers who wore it through the rest of the war. As Milburn Saunders put it, "Thus, the leg served both with the North and the South." Dahlgren's leg is often mentioned in conjunction with Jackson's arm and Sickles' leg. Laura Bergheim asks, "Why this fascination with preserving limbs?" and answers, "The Civil War left more Americans severely maimed than any other conflict in American history, and the near-mythic number of limbs lost during the war may explain the sentimental devotion and even obsession about the missing parts." As a final indignity honor, the Hagerstown Suns baseball team have created an Ulric Dahlgren bobblehead doll to be given away at ballgames.